All weekend seemed like one big party/visit. And it was. Leo’s brother Paul was up for the weekend so Leo was busy entertaining him. PAUL visited the farm and saw the llamas that Michelle bought at an auction. Pets for Kimia I’m sure. Then he went shopping with Michelle while Leo and the guys watched CFL – Yeah Roughriders! He came home with some fish which died overnight and some plants which were still living this morning when he left. 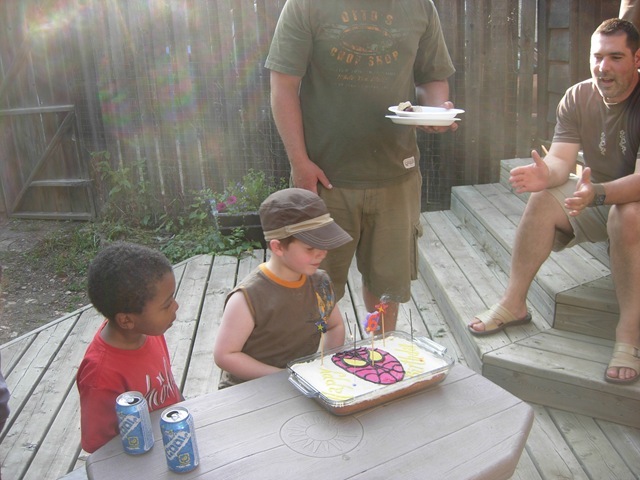 Yesterday was Kieran’s sixth birthday party. The plans were to have a barbeque out at Little Red Park. It was a beautiful day yesterday and there was not a single picnic table to be had out there. So just before I left for the park, thinking that was where the festivities were happening, I got a call. “Can we all come to your place?” So there you go – always have the house in some reasonable semblance of order for these unexpected occurrences! We have a nice yard and over the weekend I actually did a lot of weeding and planting and had gotten it in decent shape. So we celebrated in style. Kieran had a good time and that was the main thing. You do indeed have a nice yard, and we very much appreciated your hospitality within it. hey looks like lots of fun.